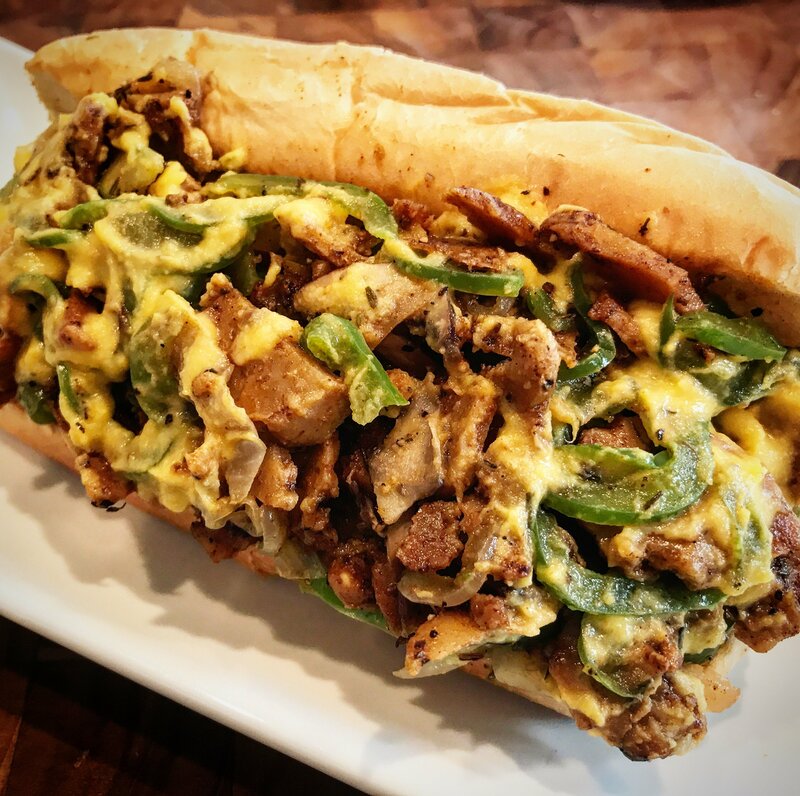 This vegan cheesesteak is big, bold, and packed with robust flavor! Thin-sliced seitan is seasoned to perfection with a spicy homemade blackening seasoning blend and tossed with a colorful mix of peppers, mushrooms, and onions. Top it all off with a cheddar-style sauce and you’ve got a cheesesteak experience worthy of the City of Brotherly Love. 1. In a small bowl, stir together dried thyme, paprika, granulated sugar, onion powder, garlic powder, salt, ground black pepper, cayenne powder, and dried oregano. 1. Fill a medium saucepan with 3 cups water. Add cauliflower and carrots. Bring to a boil and cook for 8 minutes, until vegetables are tender. Remove from heat and drain well. 2. To a food processor or blender, add cauliflower florets, sliced carrots, olive oil, water, lemon juice, nutritional yeast, onion powder, and salt. Puree until consistency is smooth. 1. In a medium size bowl, toss sliced seitan with blackening seasoning to coat. 2. In a large skillet, heat 1 tablespoon olive oil over medium heat. Add sliced green peppers, mushrooms, and onions. Season with salt and pepper. Cook, stirring frequently for 5 minutes, until peppers and onions are softened. Remove peppers and onions from the pan. 3. To the same skillet used for cooking the peppers and onions, add remaining 1 tablespoon olive oil. Add seasoned seitan and cook 5 minutes, until heated through. 4. Add peppers and onions back into the pan with the seitan and lightly toss together. 1. Divide seitan and pepper mixture between hoagie-style sandwich rolls. Top with cheese sauce and serve warm. What a great idea! This looks delicious. The seasoning especially. Yum! Thanks! I like to keep a big batch of the seasoning on hand. So fun! I became vegetarian before I made it to Philly, but maybe I’ll finally have a chance to taste the famous cheese steak now! Oh my. My mouth just watered there.. This sounds so delicious. I wish you lived at my house and could cook for me. Wow that sandwich is loaded with all kinds of good stuff. Looks so darn good wish I had everything to make it for tonight. Making a new grocery list. 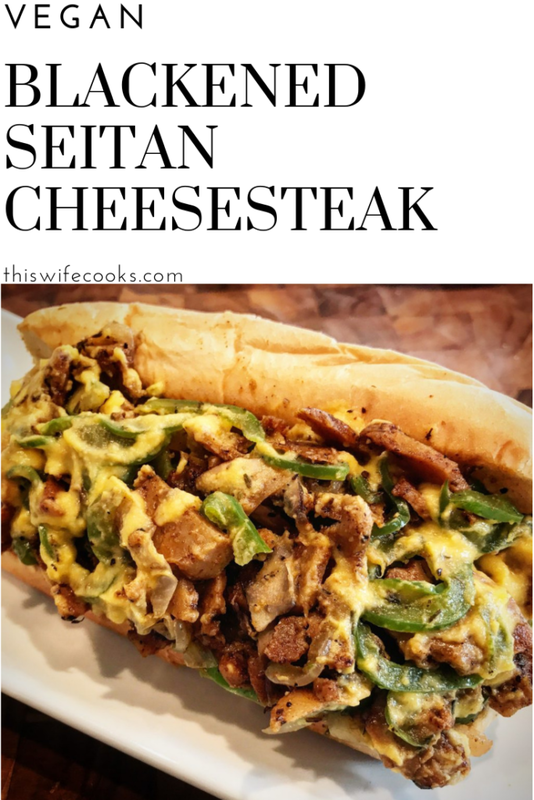 I never tried Seitan before, but my husband loves Philly Cheesesteaks so I’ll have to show this to him to try some time!